21 LED Bulbs: Everything you need is right in the box – simply screw the LED bulbs into the sockets for wonderful ambiance! Energy - Saving Lighting: Cut down your electric bill. These hanging bulbs have highly efficient 1-Watt-LED. The LED light bulb consumes up to 85% less energy and lasts 10 times longer than incandescent bulbs. Put out as much brightness as the incandescent ones. 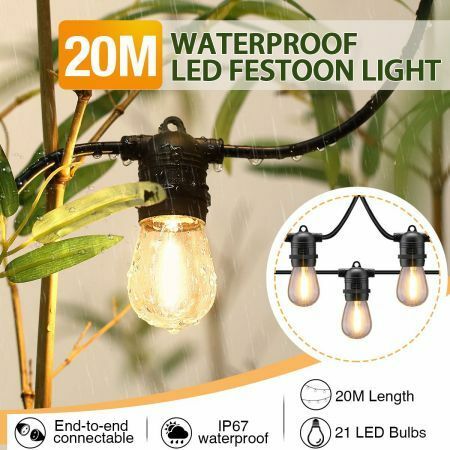 Can Buy and Connect up to 2 Strings for 40m Of Lighting: The female socket on the opposite end allows for connection to multiple strings for the extra length of beautiful patio string lights. You can buy one more strand and connect them (20M/ strand) end to end. Add a touch of magic and romance to your parties, festivals or other special events with an array of LED Festoon String Lights! Perfect for decorating the wall, fence, balcony, roof, patio, pillar, stairs, or even trees, these Festoon String Lights give off an elegant, warm glow and create a lovely, beautiful atmosphere. Each string of lights includes 20 LED bulbs, each of which is 1-watt, energy-saving and long-lasting. This strand of lights we provide here contains 20 LED bulbs evenly spaced at 0.9M apart, and you can also buy one more strand to connect them end to end, creating a longer string light with a maximum length of up to 40m. The built-in sockets on the string make it easier to install the LED light bulbs anywhere you want. Coupled with heavy duty wires, the waterproof socket lets you feel rest assured with outdoor use. Shop for LED Festoon String Lights and enjoy a wonderful night with your loved ones! Built-In Loops for Hanging: Simple and easy-to-use socket loops allow for installation anywhere that's desired. 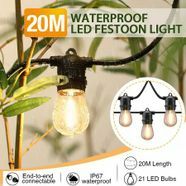 Durable & Waterproof: Outdoor string lights are made from heavy duty wires and have special water-proof sockets that form a seal around the bulb for keeping out water.